Faculty judges evaluated the finished homes, and prizes were awarded for the top three designs. 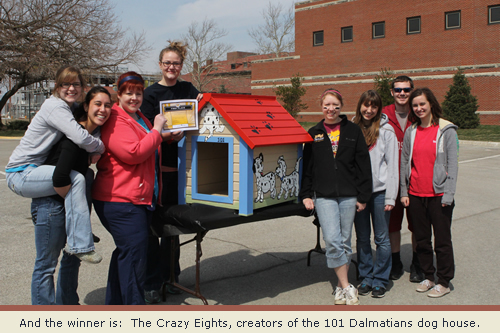 First prize when to the team “The Crazy Eights!” (Elaine McCarthy, Melanie Papariella, Katie Hecke, Rachael Breeding, Jenna Yeager, Danae DeVries and Laurie Morman) for their “101 Dalmatians” doghouse. Second prize was claimed by the creators of Jurassic Bark” (Kimberly Jen, Samantha Hawthorne, Nick Hinton, Kelli Zimmerman, Erin Walsh, Britney Kraft, Amber Kerk, Sarah Lance and Marshall Wade), and Third prize went to “Team Happy Tails” (Jen Forgash, Janelle Davidson, Rachael Williams, Stephanie Mayard, Lauren Adduci, Alyssa Brook, Stathia Nguyen and Erin Toone). Organized by veterinary students Pamela Ziolkowski, Meghan Komorek, Emily Rudman and Christie Blatcher, the event was covered by local CBS affiliate WLFI-TV. Faculty members Kathy Salisbury, Mimi Arighi, Annette Litster, Lynn Guptill, Wendy Townsend and Jonathan Townsend served as the judges. 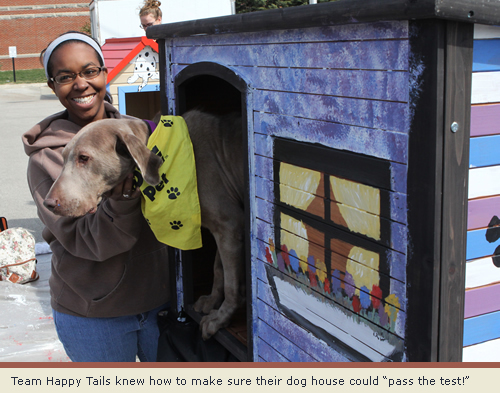 At the end of the event, the Clinton County Humane Society was very happy to receive the beautifully crafted dog houses. Plans already are afoot to continue the competition next year, perhaps benefitting another humane society.